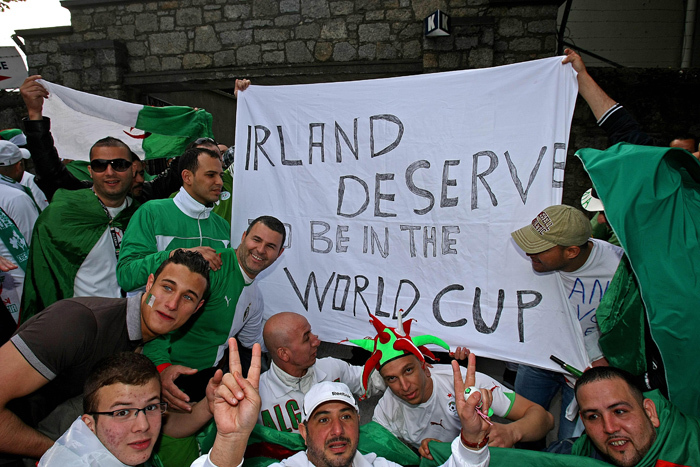 Algerian fans with a message about Ireland not being in the World Cup during the International Friendly at the RDS Stadium, Dublin. Ireland continue to beat World Cup-qualified teams, no doubt wanting to prove a point to Monsieur Henry and the rest of France. This was a comfy win against England’s second World Cup group opponents, with goals by debutant Paul Green and Robbie Keane (2). England should also beat Algeria without much ado. Should. Did you know? This was the first time the RoI managed to score more than two goals under current manager Giovanni Trapattoni. Although warm-ups are pretty much friendlies and nothing more. I’m surprised at how many World Cup go’ers are so piss-poor and losing all these friendlies to World Cup non-go’ers. And also teams under-performing. I mean Serbia losing to New Zealand?? Cameroon tying with Slovakia? Spain scraping past Saudi Arabia? maybe an omen some countries are totally “not ready” for the WC and are gonna crash and burn big time.